Ben had a free flight Buccaneer Std way back in the early 1970's and I can remember myself and the two Ayres brothers, Micheal and Steve chasing off after it at the Nats. at Little Rissington in the mid 1970's. 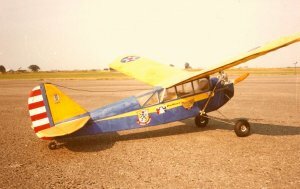 The same model was later converted to single channel radio by Ben and was one of his first goes at R/C flying. The Buccaneer Std kit includes pre cut wing ribs, tip shapes and formers, balsa strip, sheet and block parts, undercarriage wire, glazing, hardwoods and dowel, a hardware pack and full size plans. Everything needed to build the basic airframe of the model.